Where you can purchase a certified pre-owned Ferrari is a common question and concern for people looking to buy only the finest examples of used Ferraris. Quite frankly, certified pre-owned vehicles by all manufactures have become a very popular alternative to buying a brand new car. Certified pre-owned vehicles tend to be a terrific value, often a better quality than a standard used car, and they will give the buyer the peace of mind of an extended warranty to help offset any future costs that the car might have after purchase. Many buyers value the extended warranty the most from a certified pre-owned vehicle, but the real reason these vehicles are of better value is because of the reconditioning process the vehicles undergo to become certified, not the warranty. Manufacturers have a list of requirements that dealers must meet to ensure the vehicle is qualified for certified status, this could include various items such as, engine standards, miles, age, etc. So, the question I like to ask is, what is more important, the extended warranty on the used Ferrari Testarossa, or the level of reconditioning and service that was done to make sure the Ferrari is in impeccable condition for the next consumer? To me, this is not just obvious, but this is also very similar to what I do when I am purchasing Ferraris for my dealership. I examine the service records to determine the car’s condition, where the service was done, who performed the service, the parts used, etc. This helps me to determine the value and gauge if my Ferrari technicians will need to do more work outside the normal process all our vehicles undergo before sale. The next question I have my clients consider is, what if there was a dealer who reconditions their used Ferraris the closest to perfection that is possible with the car. In addition, what if the dealer was so confident in the condition of the car, and all the reconditioning that was performed, that they offer a certified program that mirrors the manufacturer’s program? Further, what if the technicians reconditioning the Ferraris were master certified Ferrari technicians, some carrying a name known from coast to coast because of the unique talents with Ferraris? My final question is, should you be looking for certified pre-owned Ferraris, or the Ferrari with the best value? While not every dealer will do all mentioned, and not every dealer will have renowned Ferrari technicians, I wanted to illustrate the actual, important issues when looking at buying a pre-owned Ferrari, and the important benefits of a certified vehicle. 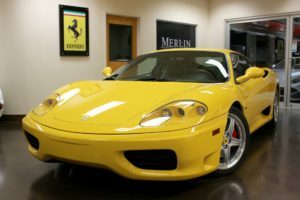 In closing, be sure to look at all Ferrari dealers when you are shopping for your next pre-owned Ferrari 360 because there are independents Ferrari dealers that offer certified programs replicating the manufactures program.